Today, in things the internet made happen with its terrible psychic powers: Stranger Things’ Steve Harrington and Parks & Rec’s Jean-Ralpio Saperstein—the subject of a popular meme suggesting that the former is actually the latter’s dad—met up in person for some family bonding time. 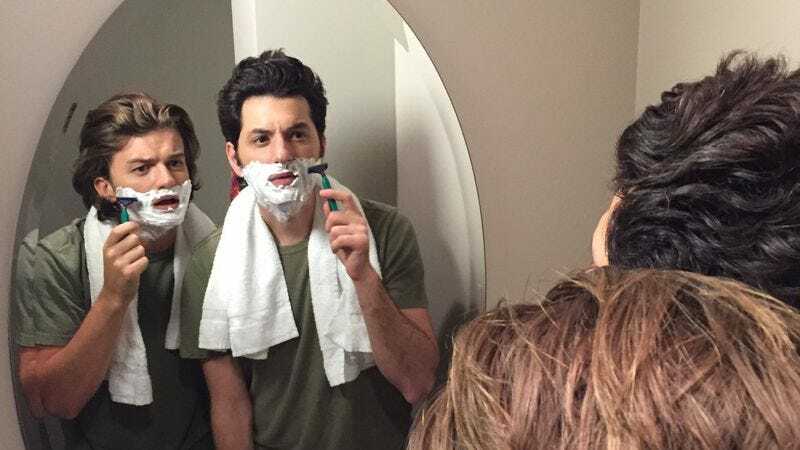 The pair—or, rather, actors Joe Keery and Ben Schwartz—posed for a photo shoot referencing the fan-theory, which says that the two Indiana-set series are connected by one shared, huge-haired bloodline. Scwhartz, who’s previously given his blessing to the idea, posted pictures and video of himself with Keery on social media today. Clad in similar plaid shirts, the two really do have a family resemblance. (It’s the eyebrows, we think.) As such, the photos present a heartwarming little reunion, especially when Steve takes the time to finally teach Jean-Ralphio how to shave. (Or vice-versa? Time travel-based bonding is kind of hard to keep track of.) Schwartz has joked in the past that he expects to be featured on “Stranger Things seasons 2 through 100,” which, given that both Parks and his other show, House Of Lies, are now over, seems less Upside-Down than it might once have been.